【化学】 ジルコニウム 《金属元素; 記号 Zr》. From a New Latin coinage, from zircon. A metallic chemical element (symbol Zr) with an atomic number of 40. Zirconium ( /zərˈkoʊniəm/ zər-koh-nee-əm) is a chemical element with the symbol Zr and atomic number 40. The name of zirconium is taken from the mineral zircon. Its atomic mass is 91.224. 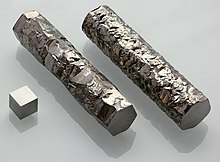 It is a lustrous, grey-white, strong transition metal that resembles titanium. Zirconium is mainly used as a refractory and opacifier, although minor amounts are used as alloying agent for its strong resistance to corrosion. Zirconium is obtained mainly from the mineral zircon, which is the most important form of zirconium in use.